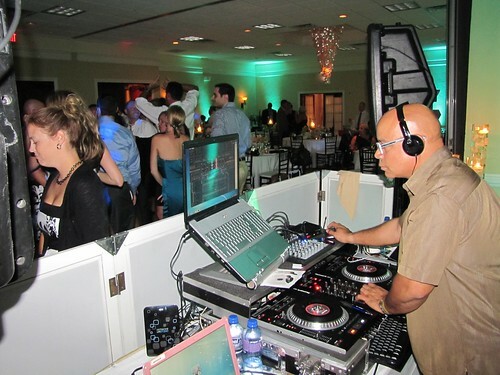 Florida’s leading DJ Entertainment Choice! Lauren and Jason once envisioned a picture perfect tropical wedding in the Keys. However, the ever changing Florida weather turned their sunny day into a wet, soggy afternoon at the Cheeca Lodge. The ocean breeze moving heavy rains in to the beautiful beach setting and torrential downpours attempted to dampen the mood. Alan and his staff at Cheeca Lodge deciding that a break in the storm was unlikely as they quickly moved the ceremony inside the resort. 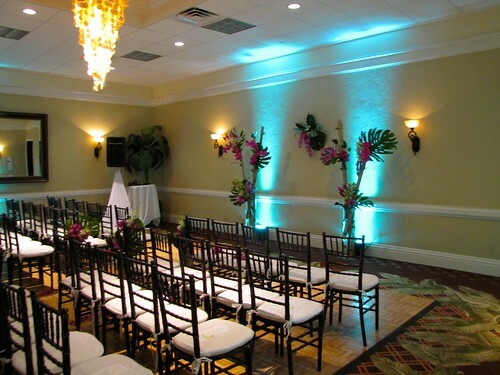 The Bougainvillea room became the new location for the ceremony which began precisely at 5:30 as light Caribbean music filled the ears of guests awaiting the brides entrance. Music heard during the ceremony coming from a Steel Drummer provided by MB Entertainment. Regge Calypso music continued playing as the precession began. During the ceremony guests were treated to a very special guest Mr. 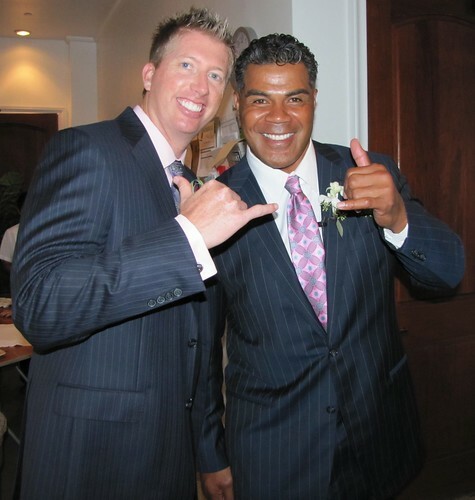 Junior Seau. The former NFL player playing the part of the officiant during the ceremony. Caribbean music continuing to fill the atmosphere following the ceremony as guests moved to the Hibiscus room for a cocktail hour prior to the reception. During the cocktail hour staff at Cheeca Lodge worked diligently transforming the Bougainvillea room from the wedding ceremony to the reception area. Magical up-lighting covering the walls and turquoise decorations filling the room set the scene for a beautiful reception in the Florida Keys. After guests entered the magnificent setting the bride and groom made their grand entrance making their way to the center of the dance floor. The stunning couple, glowing with happiness and love, began their first dance to Keith Urban’s “Without You.” The couple dancing joyfully as MB entertainments Saxophone player Leo Casino awed guests playing along during the first dance. Immediately following the first dance dinner was served. Guests enjoying a delicious beef tenderloin with baked potato and greens as saxophone player Leo Casino continued to awe them as he played in both alto and soprano. Full introductions of the wedding party took place as guests finished up their meals. The newly weds followed the introductions into the cutting of the cake. MB entertainment kept the party rocking for the next three hours as guests enjoyed big hits like “Hey Soul Sister” by Train, “You Shook Me All Night Long” by ACDC and “A Party in The USA” mashup by DMX. The evening came to a close as the couple took the dance floor as Donna Summer’s “Last Dance” played. As the song ended and guests believed the night to be over “Coming to America” took over the speakers and the groom, Jay, and his friends hit the dance floor closing the evening with a special routine they had planned out! A little rain may have made a few changes to the wedding but ultimately had no effect on this magical night. Thanks going Mr. Seau for his service during the ceremony and to MB Entertainment’s Mike and DJ 911 for providing wonderful music all evening as well as saxophone player Leo Casino. Also, a big thanks goes out to Alan and his staff for turning what could have been a disastrous wet evening into a picture perfect wedding! You Tube Watch our videos on You Tube! Linked In MB Entertainment is LinkedIn!